How Sweet it is?Jane Roberts was the average girl next door until she and her best friend, Scarlett Harp, landed their own reality show, L.A. Candy. Now the girls have an all-access pass to Hollywood's hottest everything. But there's more to life on camera than just parties and shopping. . . . When racy photos of Jane are leaked to the press, she finds herself at the center of a tabloid scandal. She turns to her co-star Madison Parker for help, unaware that Madison is scheming behind the scenes. She might be Jane's shoulder to cry on, but does Madison really have Jane's back?Scarlett's working on a scandal of her own. She's fallen for someone who's strictly off-limits—which means Scarlett has a big secret to keep . . . from the L.A. Candy cameras, the paparazzi staking out her apartment, even from her best friend.Of course, nothing stays secret for long for the stars of the newest hit TV series, and all this drama couldn't be better for ratings. 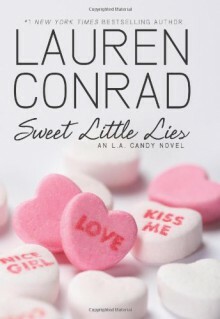 But can Jane survive another season in the spotlight?In television star Lauren Conrad's dishy, entertaining novel about young Hollywood, the lies are only as sweet as the people telling them. This book was just okay for me, it is not the best sequel I have ever read. I will be reading the third book in this trilogy, but not for a while. I found the plot to be kind of slow and boring.